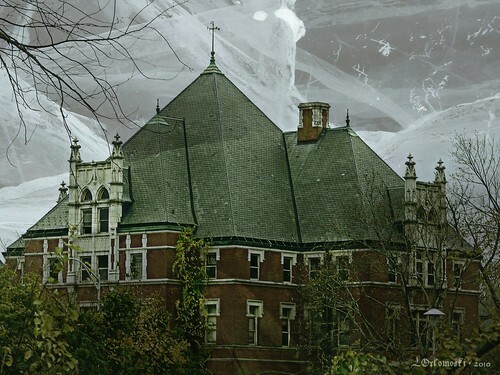 Even without the added creepy effects available from Picnik, the old Norwich State Hospital Administration Building lends an air of spookiness to the area. Sadly, this building may soon be a thing of the past as the Town of Preston is currently working on demolishing the old buildings at the former Norwich State Hospital in the hopes to someday add bigger and better things to the property. In my opinion that's really too bad as I bet people would have paid good money to take tours of the old hospital grounds and learn some of the history of what was once a city unto itself until the State thought it was a good idea to close it down. Boo to the State of Connecticut and boo to the Town of Preston both! I hate the idea of bulldozing buildings whose construction is clearly superior to anything they are building nowadays. I'd hate to be a roofer on that particular roof though! Have fun on your trip. Wishingyou great foliage, crisp air, tons of fun and lots of great fall foods! oh what a shame that it will be demolished because that is a beautiful building. It's great that you have a good photograph of it before it's gone. I LOVE the roof pitch on it. seriously? oh too bad! i guess no one has money for such things any more. i hate this. another part of history will be lost. Wow...this would be fab re-tooled as condos. Just sayin'. Really beautiful. They'll tear it down and build something tacky and substandard...probably. Trveling Bells has it right. Lots of these old buildings have been refurbished as swanky condos. If the building condition is basically good, there is no sense in wasting an historic site in a beautiful old building. Great effects, Linda. They look really creepy.